Another month in drawdown. This is where the lesser experienced would begin to question the validity of their system. Has something stopped working? Did the market change? If you design your strategy based on a helter skelter of methodologies...you may have a point. But, if you build your system based on capturing the market's inherent behavior: stocks can exceed 100% returns but never exceed 100% loss (unless on margin). Then you know when the market turns south...you'll turn south. Nothing you can do but weather the storm. The fortunate thing is you have allocated your money based on this knowledge...that there will be storms. And you must wait for the storm to pass...the skies to clear...and the markets to return. Below are the sector breakdowns for the portfolio. The cash level increased 35% from last month's level. Again, the increase in cash will reduce the portfolio's drawdown should the market continue to stall. But, decrease our returns should the market recover. 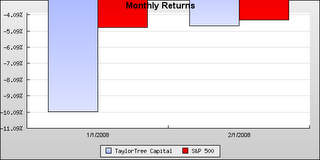 In fact, you can see in the chart below the difference the cash level is making to the portfolio. 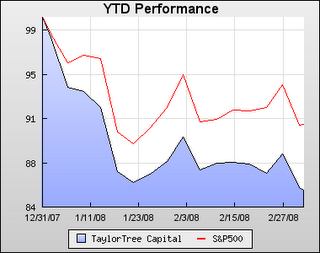 February's drawdown is beginning to slowdown in comparison to the benchmark. As we move further and further into the market's downturn...the portfolio will begin to break off from the benchmark due to the rising cash level. This rising cash level is due to 29% of the portfolio's positions hitting trailing stops since Jan 1st. In that same timeframe, our new new positions increased by 4%. Is this good or bad? Neither. Just the way the market works. On a side note...the weather here in Missouri is toying with us. You can tell spring is trying to push it's way in...but the winter isn't giving up without a fight. Crazy thing to be riding bikes in short-sleeves one day and bracing for snow the next. Markets and weather...what fun.